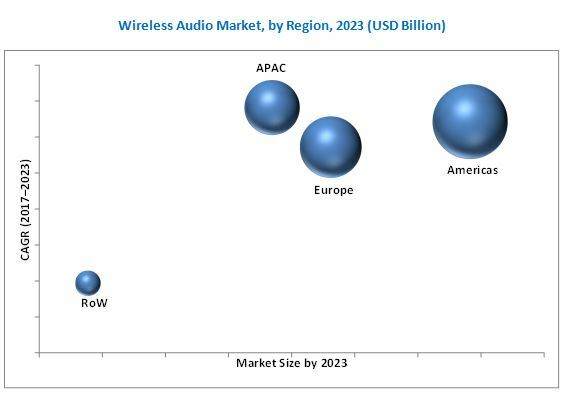 [167 Pages Report] The wireless audio market is expected to grow from USD 16.13 Billion in 2016 to USD 31.80 Billion by 2023, at a CAGR of 10.06% between 2017 and 2023. The base year considered for the study is 2016, and the forecast period is between 2017 and 2023. Factors such as increasing demand for smartphones as a source of entertainment, consumer preferences for portable devices, and advancements in wireless technologies are driving the growth of the market. The report aims at estimating the market size and future growth potential of the wireless audio market based on product, technology, application, and region. The report analyzes the market structure by identifying various subsegments of the wireless audio market. The report aims at identifying the major market trends and factors driving or restraining the growth of the wireless audio market and its various submarkets. Moreover, this report analyzes the value chain of the wireless audio ecosystem. Furthermore, the report analyzes opportunities in the market for stakeholders by identifying the high-growth segments of the wireless audio market, strategically profiles the key market players, and comprehensively analyzes their market size and core competencies in each segment. The research methodology used to estimate and forecast the wireless audio market begins with obtaining data on key vendor revenues through secondary research. Some of the secondary sources referred to for this research include Wireless Speaker and Audio Association (US), Audio Engineering Society (US), and the International Loudspeaker Association (US). The vendor offerings have also been taken into consideration to determine the market segmentation. The bottom-up procedure has been employed to arrive at the overall size of the wireless audio market from the revenues of the key players. 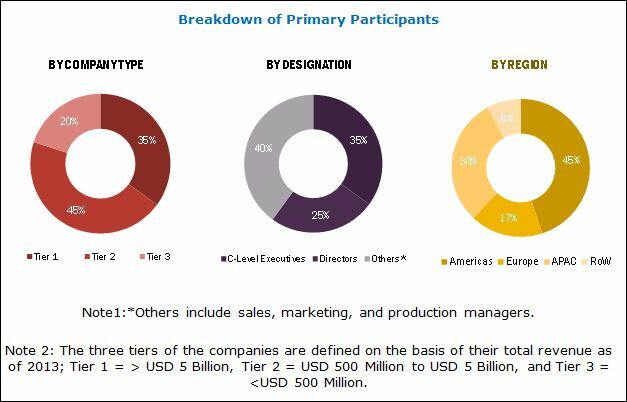 After arriving at the overall market size, the total market has been split into several segments and subsegments, which have then been verified through primary research by conducting extensive interviews with key people such as CEOs, VPs, directors, and executives. The market breakdown and data triangulation procedure have been employed to complete the overall market engineering process and arrive at the exact statistics for all segments and subsegments. The breakdown of primaries participants has been depicted in the following figure. The wireless audio market ecosystem includes R&D associations, manufacturing and suppliers, software solution providers, and end users. The wireless audio market comprises major players such as Apple Inc. (US), Samsung Electronics Co., Ltd. (South Korea), Sony Corporation (Japan), Bose Corporation (US), Sonos. Inc. (US), DEI Holdings, Inc. (US), Harman International Industries, Incorporated (US), Sennheiser electronic GmbH & Co. KG (Germany), VIZIO, Inc.(US), and VOXX INTERNATIONAL CORPORATION (US). The wireless audio market is expected to grow from USD 16.13 Billion in 2016 to USD 31.80 Billion by 2023, at a CAGR of 10.06% between 2017 and 2023. The growth of this market is propelled by the increasing demand for smartphones as a source of entertainment, consumer preferences for portable devices, and advancements in wireless technologies. This report segments the wireless audio market on the basis of product, technology, application, and geography. In terms of product, speaker systems are expected to hold a major market size by 2023. In case of wireless speakers, no wires are connected to the speakers or to the sound systems. In addition, smart devices can be directly connected to the speakers through wireless connectivity. Therefore, consumers prefer wireless speakers. The market for Bluetooth +Wi-Fi technology is expected to grow at a high rate between 2017 and 2023. Combo wireless modules are mainly used in smartphones, smart meters, medical devices, and home audio devices. The increasing adoption of combo wireless modules for various applications is contributing to the high growth of the market. Home audio applications are expected to hold a major market size between 2017 and 2023. The growth of this market can be attributed to the continuous technological innovations in home audio devices and increasing consumer demand for high-performance home theaters, owing to rising disposable income. In addition, developments in Wi-Fi and Bluetooth speakers and dedicated speaker docks are expected to increase consumer spending on audio equipment for enhanced audio quality. Suppliers and manufacturers of such equipment are increasingly focusing on expanding in the market by making these systems user friendly and visually less intrusive. In addition, there is an increasing demand for portable audio equipment, which has the ability to stream high-quality audio content from the Internet. Therefore, the advancements in digital technology, with changing media options from conventional to modern system, are contributing toward the growth of the market for home audio applications. The growth of the wireless audio market in the Americas is likely to be fueled by the increase in sale and installation of home entertainments systems. The growing population of music listeners, increasing digital music sales, and popularity of the audio & video entertainment segment are expected to influence the regional market positively over the next decade. The US is at the forefront of installing and buying the upcoming technologies such as wireless speakers and home entertainment systems. The wireless audio market APAC region is likely to grow at a high rate between 2017 and 2023. The market for consumer electronics, including smartphones, tablets, and wireless audio devices, in APAC is increasing rapidly with a high rate of development in most of the countries in this region. In addition, factor such as rising urbanization, individuals’ acceptance for the developments based on innovative technologies, and increasing popularity of streaming music services are contributing to the growth of the wireless audio market in this region. The major challenges for the companies in the market include delivering high-quality audios. The major vendors in the wireless audio market include Apple Inc. (US), Samsung Electronics Co., Ltd. (South Korea), Sony Corporation (Japan), Bose Corporation (US), Sonos. Inc. (US), DEI Holdings, Inc. (US), Harman International Industries, Incorporated (US), Sennheiser electronic GmbH & Co. KG (Germany), VIZIO, Inc.(US), and Voxx International Corporation (US).